Now I am not into scary, but I do like to be part of the season, so a few years ago I did a Happy Halloween Tablescape. Here is a repeat. I can't remember where this Jack-O-Lantern came from, it has been around for years and years. With a candle inside it makes for a happy smiley face pumpkin. Orange and black is the theme. I had a black piece of fabric, so I am using that as a tablecloth, some orange candles, votive dishes, flowers and napkins and this is looking pretty Halloween. 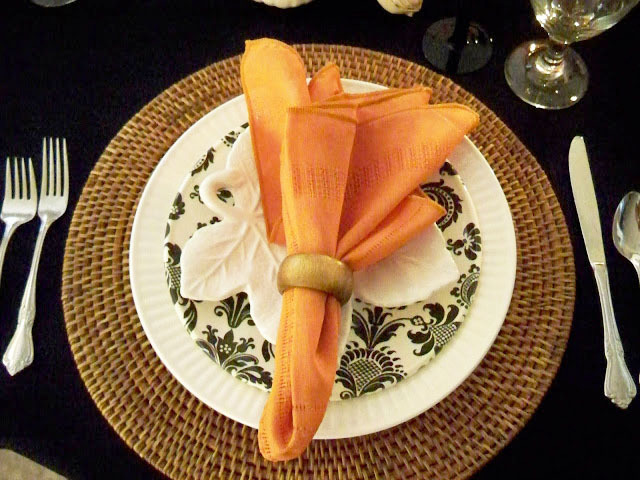 A simple place setting with an accent plate in black and white and a fun leaf plate just because. Faux Dollar Tree corn and pumpkins scattered around the table. My Happy Jack is sitting in a ring of berries and sunflowers. That's it. Nothing fancy but I think it is a lot of fun and I definitely like my Jack's happy grin. So do you go for scary or do you like happy? I love it, Marty. That is a cute pumpkin and not a scary one. I like happy, mysterious or with literary inspiration. 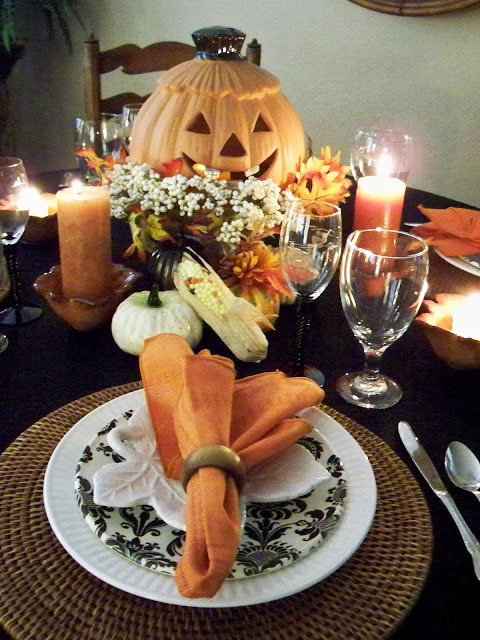 Your jack o lantern tablescape brought a smile to my face. Too cute! Love it! I had two of these exact jack-o-lanterns... husband dropped and broke one, but the remaining one I still have. I use it on the front porch most years. So darned cute! This is so cute Marty! 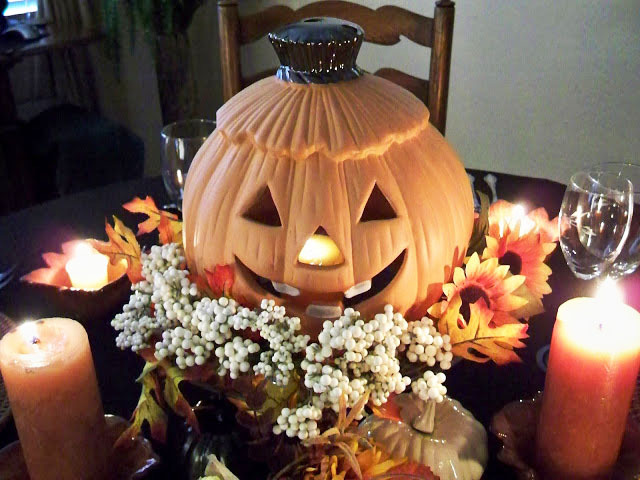 I love the jack-o-lantern as a centerpiece! I agree with you on the none-scary kind of halloween! I guess I go for happy. You are so good at creating tablescapes! I like cute! No scary for me. The jack o latern is cute and the table setting is beautiful. Thanks for sharing. Mostly cute! A little bit of creepy is olk. Ha! Hi Marty! I'm with you - I don't like scary. 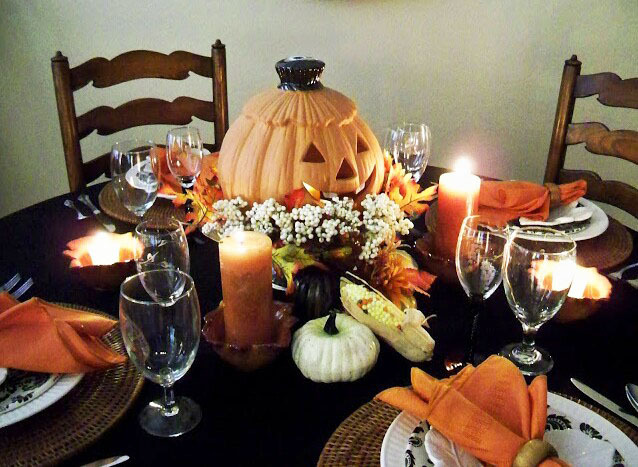 Your tablescape is so cute and love your happy little Jack o lantern! 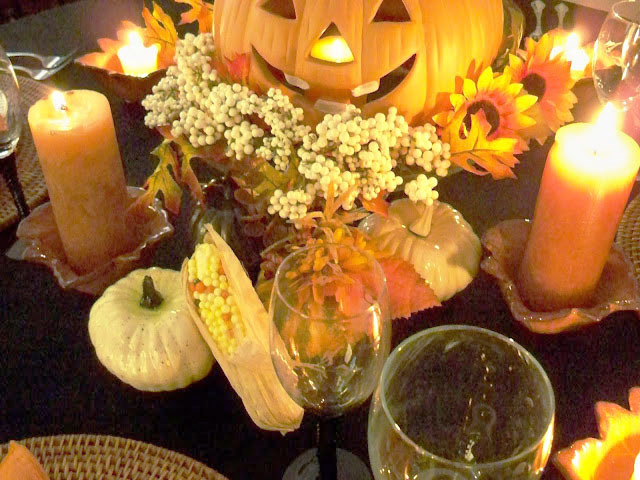 Your jack o lantern tablescape brought a smile to my face. Too cute!